MACRO Leaders is a model that I have developed to guide my work in transforming leaders and organisations. The acronym MACRO stands for: Mindfulness, Authenticity, Courage, Resilience and Openness. Are you a leader who wants your message to leave a lasting impact? Help your audience to let go of their worries, be present and connect with each other and the message you want to deliver. Teach in a way that your message will be remembered and become part of your audience's consciousness. Whether you need and intro, acknowledgment of country or meditation for 5 minutes at the start of your event or facilitation over a 3 days retreat, I can help! SYDNEY! SECURE YOUR SPOT NOW FOR THE NEXT WORKSHOP! "Lina reaffirmed my belief in how ready I am to fully step into a fully thriving business. She gave me insight into the strength of my conviction - How I'm already taking determined courageous action - to keep walking in that direction"
"I work in sales, and Lina's workshop has helped me to shift my perspective on how to listen. I could not be more grateful!" "Lina. I think you are amongst the best in the facilitation space...You walk the talk...mindful practice in a living form...I learn a lot from watching you...silky!" 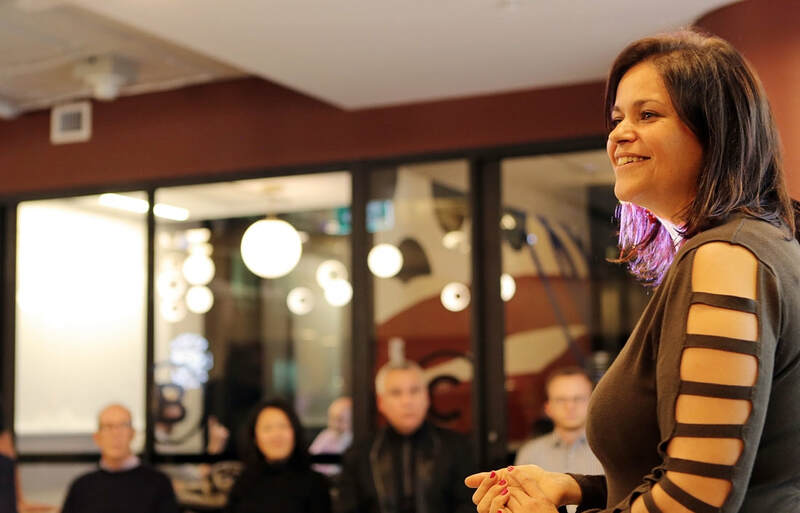 "Lina is an authentic speaker, very real in her approach to engaging an audience. That's what sets her apart. Mindfulness is not only in her cooking. Her talk is just as delicious! Cheeky brilliance sums up Lina's work and play perfectly!" "I attended Lina's workshop out of curiosity, keen to get a taste of he content and the community. In this brief time, I have received inspiration, heard stories from past challenges of others, and had my vibe raised by the energy in the room!" "Lina, what can I say but WOW. In the short time I spent with you, you managed to take to me to a very deep insightful place. Teaching me how to really listen and how to appreciate the magic of food was great but the most valuable thing I took away was the connection I made with my core purpose. Thank you for your help, love and that beautiful big smile that never seems to leave your face. Can't wait to see you again." "Lina creates a space where people allow themselves to look at and understand how to connect, converse and appreciate the others and your own point of view. I thank you for that space!" Thank you for such a great session on mindfulness. The world is so much brighter when we ask ourselves to be ourselves more, and honestly shine." "I love how Lina creates a space that is warm, welcoming and inviting so I can just open and learn. Thank you for the beautiful evening. I've met some nice people who shine with me!" "It was an interesting experience to have mindful facilitation, it opened up the energy in the space!" "Lina created a beautiful soulful space for people to connect with each other more deeply and genuinely than I have experienced in a long time"
"Lina. What a sweet presentation! I loved the question about time and money - Really made me think about what's important!" We are so grateful for your magnificent facilitation throughout our 2017 WDP retreat. We are all so blessed by your presence, guidance + magical "holding of the space". Thank you for your loving patience + believing in us + this vision. We hope you can now enjoy a moment to relax and be nurtured in the incredible way you have nurtured each one of us.